ThePriceTest.com: Organic Anti-Aging Vitamin C Serum With 20% Vitamin C + E + 11% Hyaluronic Acid + MSM For Fading Wrinkles, Freckles, Acne Scars, Discoloration & Age Spots On Face And Hands. 1 Ounce. 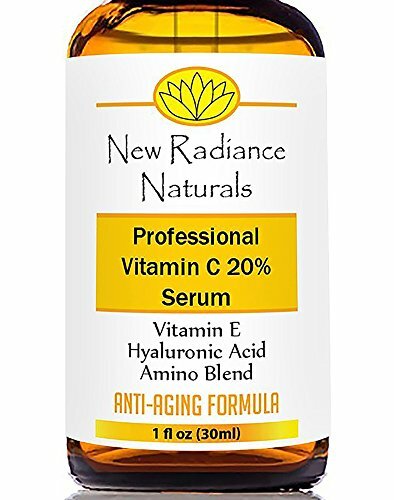 Organic Anti-Aging Vitamin C Serum With 20% Vitamin C + E + 11% Hyaluronic Acid + MSM For Fading Wrinkles, Freckles, Acne Scars, Discoloration & Age Spots On Face And Hands. 1 Ounce. LOOK TEN YEARS YOUNGER! Dr. Oz consulted with the nation's top plastic surgeons to find alternatives to popular cosmetic surgical procedures. The #1 Secret To Drop A Decade From Your Face was topical Vitamin C. And combining Vitamin C and E together gives a "super powerful anti-aging punch!" BEST NATURAL AND ORGANIC INGREDIENTS - 100% CRUELTY FREE! We use only vegan, cruelty-free formulations containing natural/organic active ingredients. No parabens, no sulfates, no gluten, no alcohol, no phthalates, no animal testing. Our serum is 98% natural and 72% organic and 100% plant based, and is made in the USA in our advanced FDA registered facility.